Home » Community » The BIG E3 2018 Party List: Events, fundraisers, after parties and more! Fam. Listen up. We made it. We survived through an entire year of non-E3 partying to make it to this moment: E3 partying. And hey, look at that! 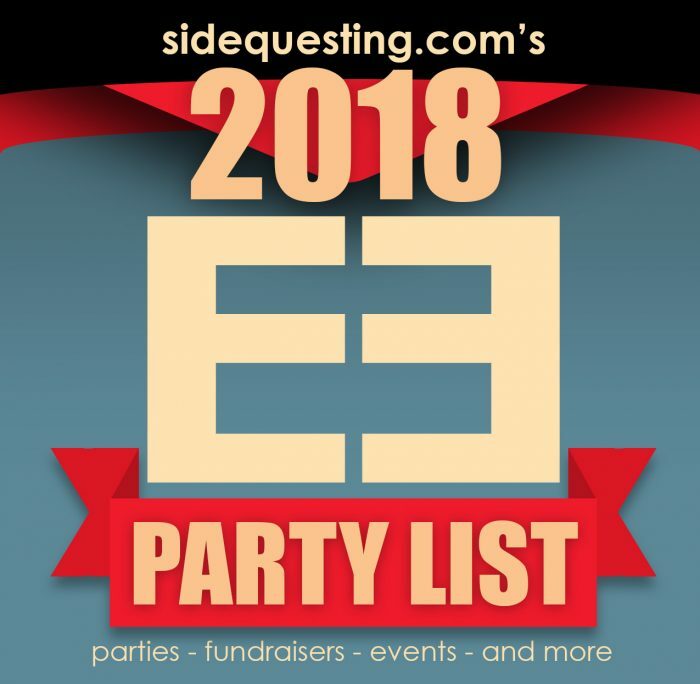 It’s SideQuesting’s E3 2018 party list, RIGHT ON SCHEDULE! We want to make sure that you have access to all the events that can fill your heart with music and glee and gaming promotions at the annual BIG WEEK. But hey, we have some important changes this year. This list will be geared towards the public events, and we will be MAKING SURE to minimize the industry and invite-only events that we post (please let us know if we’ve fucked up). It’s not difficult to get into these: just become a part of the industry. Develop, blog, write, record, sell things — whatever aspect of the business you do, just do it. Easy peasy pumpkin squeezy. In the meantime, you want to party. So, here’s the list that we have available THUS FAR. And remember: come back daily because we’ll update it as often as possible! This year, the FACEBOOK GROUP is geared towards INDUSTRY ONLY. We are doing a soft reboot, so make sure you follow the rules when you apply (or reapply) to gain access. And again, MASSIVE thanks to Team E3 Party: Becky, Jacqui, Dan, Bryanna, Duane, Adam, Brian, and Dali! Visit our friends at E3 Party Guide on Twitter as the events happen for updates! We are *NOT* affiliated with E3 or the ESA. We just crush a lot. FYI: Join the Party List Mailing List and stay UP TO DATE as parties are announced! CLICK HERE to join! Info: The acclaimed world-class quality orchestral performances will move tens of thousands more fans around the globe! Info: The annual Bethesda Showcase is back, presenting new games and experiences for 2018! Info: This year’s theme is ‘See the future of PC gaming’ and will showcase exclusive announcements, trailers and discussions from many of the most exciting developers and projects on the platform on the horizon. Info: FREE for E3 pass holders when you register AND show your E3 badge at the door Non-E3 badge holders can attend by registering $10. 10th Annual GGP at E3! Downtown! Info: Facebook | It’s Time to return to LA to KickOff our 10th ANNUAL E3 GGP OUTING — join us for an evening of cocktail and revelry! Info: Twitter | Entrance is for Gaming Industry and by Invitation Only – Register now for your invitation! Please note: Registration does not guarantee an invitation. Info: Join us this E3 for the ultimate Fortnite Pro-AM, pairing some of the world’s greatest athletes and entertainers with top Fortnite Battle Royale players from across the globe. Info: Machinima is hosting Sacramento Kings De’Aaron Fox and former NFL all-star wide receiver Terrell Owens in a LIVE, IN PERSON head to head in Dragon Ball FighterZ exhibition at Machinima’s E3 party @ Tom’s Uban. Info: 19+ | Featuring deejays, dancing and more! The annual event is back! Info: Facebook | Please join your friends from PlayStation and the LA Gayming Society (LAGS) for PlayStation’s first E3 LGBTQ Party! Info: Facebook | Glitch City Demo Night is a series of 5-minute micro talks, from both Glitch City and local creators. The subjects are about anything and everything, to inspire, teach, and entertain. Stay with us afterwards for the annual Indiecade E3 after-party! Info: Website | As a thank you to Fortnite fans, players and partners, on the evening of June 12 we’re hosting a celebration: Party Royale. Entry: Invite Only. Tickets available at Fortnite booth 2723 at E3. Info: Join us in LA on June 13th, 12pm – 2pm, but grab your spots quick, as this will be a small, intimate event to get you the most time with each mentor! Info: A friendly meetup for drinks and snacks with fellow games Marketing, PR, and Community Managers! Every kind of game dev or games-adjacent person with an interest in marketing and community management is super welcome! Info: The Big Indie Pitch is on its way to Los Angeles for E3 week, once again sponsored by indieSky. So, come join us as we once again focus the spotlight on some of the world’s best indie developers in one of the year’s biggest weeks for gaming. Info: The evening will be filled with surprises, exclusive sneak peeks, hands-on with Black Desert on Xbox, and a chance to meet the minds behind the game. Info: Belly and Crush 40 will both be performing with a meet and greet with Takashi Iizuka also taking place. Info: Come party the night away with various members of the game, fashion, and music industry; all in LA’s hippest esports center! WIGI E3 ’18 Party! Magic, Music and Art! Info: Explore a huge 4‐level nightclub. Chat with friends as you peruse the stunning art show. Mingle on the main dance floor. Be amazed by The Magic Castle’s talented magician tricks and shows! Info: Twitter | The MIX showcase shines a light on creativity, diversity and innovations from smaller developers. Info: Facebook |We’re proud to announce the very first solo exhibition by legendary artist, KEITA TAKAHASHI – creator of Katamari Damacy + Noby Noby Boy + Wattam. It’s called NEVER EVER QUEST, an RPG adventure in the form of an art show. Info: Facebook | Our annual E3 party will be held at The Slipper Clutch and Bar Clacson in downtown Los Angeles! It’s a great way to close down the show and meet up with your developer friends from across all the DrinkUps! Entry: RSVP on Facebook. RSVP does not guarantee entry. First, come, first serve. Info: Facebook | This is a private event, tickets are only available to E3 passholders and not general public. The password for this event will be sent to E3 ticketholders via the official E3 newsletter on Friday, June 8. Info: Performed live by an over 100-piece orchestra and choir and synced to HD footage from the game. Click HERE for trailer. Info: Website | The massive, free EA PLAY FanFest will feature hands-on gaming stations, demos, live music and more, while a networked experience will connect online players with their favorite games, content creators and each other. Info: Website | The ultimate event for Xbox fans during E3. Info: Website | Three days of panels, concerts and more! Info: Website | Splatoon 2 World Championships begin 3:30PM on June 11, with finals at 1PM on June 12. Smash Bros Invitational starts immediately after ward on June 12. Entry: Line up outside the Belasco Theater at 12:30PM for a chance to receive wristbands. 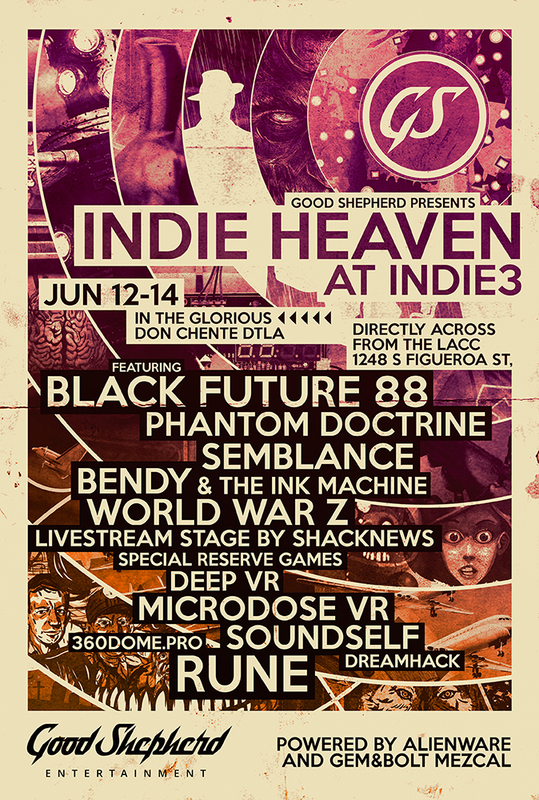 Info: Flyer | Good Shepherd Entertainment and its many gaming partners have announced the latest addition to IndiE3 – Indie Heaven – three full days of meeting, greeting and eating alongside a fantastic gathering of independent games and gamemakers.